1) Generously butter four 3/4 cup souffle dishes or custard cups. 2) Arrange on a baking sheet. 5) Sift flour over batter; fold in flour. 6) Fold batter in the chocolate mixture. 7) Divide batter among dishes...filling completely. 9) Bake cakes until tops are puffed (about 15 minutes). 10) Cook cakes 5 minutes. 2) Add sugar and liquor. 2) 2 tbs. sweet Coco Powder and Sugar combined. 1) Cut filo into squares and separate. 2) Line a sheetpan with parchment paper and place 1 square of filo on top. 3) Brush with melted butter and sprinkle with coco. 4) Continue until you have a stack of three squares. 5) Bake at 350 degrees for 9 minutes and let cool. 1) Bake hazelnuts at 350 degrees until slightly toasted...about 10 minutes. 3) Remove skins and chop fine. 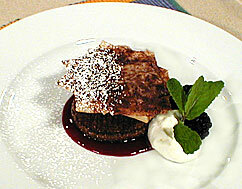 1) Serve berry sauce onto plate and top with cake. 2) Then top the cake with coco filo. 4) Spoon hazelnuts alongside of cake. 5) Sprinkle half of filo with powdered sugar.